This is a bugbear lair, although it can work as the lair of any other group similar in style, like any goblinoids or orcs. The lair is in a cave under a hill. In the main cave there is a makeshift camp, two stone pillars and a pond, fed by an underground river, the pond’s water slowly filters underground. In the first cave to the right, reachable by stairs, is a small room used as sleeping quarters. 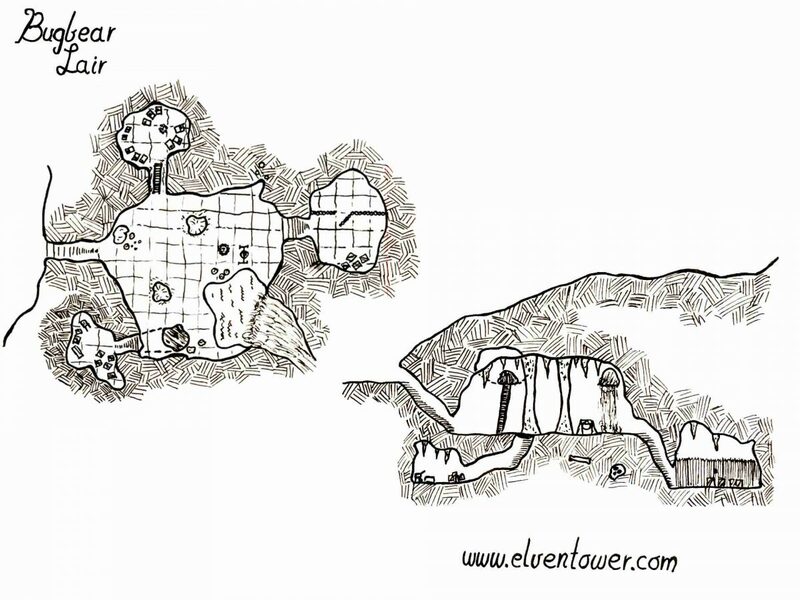 The next cave to the right is a hole in the floor, after a short shaft, it doubles back on itself and reaches a cave that the bugbears use for storage, here they keep stolen goods and loot. At the far end of the cave there is a slave pit, the bugbears have built a palisade to keep slaves and prisoners here, they can eat them later or they can collect ransom for them. Thanks for the suggestion, I didn’t really write much of a story, I guess I will put more time into that. But thanks for visiting the site !